I have been holding the question, “What does it mean to live a balanced life?” in my heart all week. And though the question is more like, “What does it mean for me to live a balanced life?” it still seems bigger than me or my day-to-day challenges. It is as if I am standing at the front of the class at the blackboard looking up at this hieroglyphic like equation with chalk in my hand. And when I turn around, everyone else is looking up expectedly with pencils raised and ready in case I stumble upon a solution. 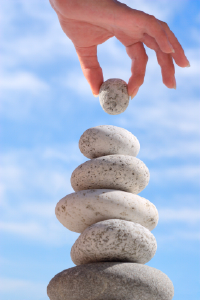 I am convinced that the struggle for balance in our lives is a modern predicament. It is born of media overload, overblown expectations of what “life has to offer” and the breaking down of the strict social and cultural caste system we call western civilization. It is both very disturbing and very exciting. So many of us former peasants and slaves expect so much more out of life than our parents, grandparents and ancestors. We expect to enjoy life. We expect to be amused. We expect to be famous for 15 minutes. We think all this hive like activity must have a larger meaning, context or purpose. What we forget is that most of us were never meant to have time to consider such grandiose ideas. Our socialization prepared us to be cogs, wheels and overseers, not artists, visionaries and dreamers. We are ill prepared for a life filled with meaning, divine inspiration and mystery. I was raised to be a worker, a leader amongst workers and if I was lucky either a teacher of workers and their children or to escape to the managerial strata … to manage workers. I was not raised to be a mystic. So whenever I try to make sense of my life, I look at it through the lens of my working class roots. Well of course, I work really hard for long hours … that is because I am a good worker. What do you mean I need to make space for thinking, writing, meditating, resting and self care? I should be working! And working … is hard! Sitting and thinking is not hard enough. I need to get back to work. So when I read, write, meditate and rest … I feel like a lazy bum. But when I am teaching, designing software, cranking out web sites and traveling all over god’s creation, it is difficult and so it is good … because it means I must be working! So I feel like I am working all the time – because I keep filling up my schedule so it becomes difficult to just sit and think. And as much as I feel unsatisfied with all these life balance challenges – I also feel like myself when things are challenging. I am nervous when I have “too” much time. What if I get caught … lollygagging? What would the other workers think? Heh! So it comes down to this …I work hard …because I was raised to work hard. I am punishing myself because of a societal imprint. I am always amazed to find that balance changes with the seasons, with my health, with outside things in life I can't predict. Balance isn't a stringent schedule or about discipline, it is about going with the flow and not pushing but finding strength and balance in my rootedness.